My first memory, when I heard that David Bradley was dead, was of him drop-kicking a footstool across the living room. Bradley, 77, who died Dec. 19 in Los Angeles, was one of the legendary eccentrics of the film world, irascible and beloved. He launched the career of Charlton Heston, amassed one of the great private film archives and toasted the survivors of silent films at his legendary New Year's Day parties. David Shedd Bradley, who died of complications of diabetes, was the son of a wealthy Chicago family that gave the city its Shedd Aquarium and was a major supporter of the Chicago Symphony. 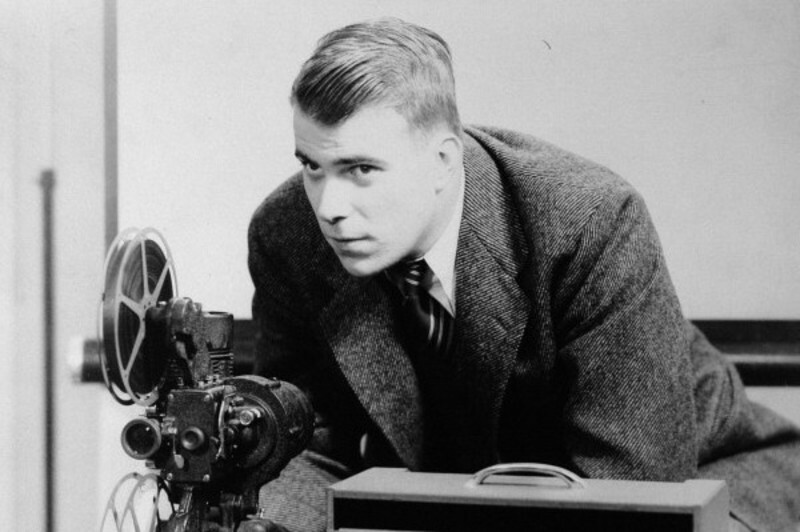 As a student at Northwestern in the 1940s, long before independent films came into fashion, he directed two 16-mm. features starring a fellow undergraduate, Heston. They were nothing if not ambitious: Ibsen's "Peer Gynt" and Shakespeare's "Julius Caesar" (in which Bradley played Caesar and assigned Heston the Marc Antony role). "They were shot on location around Chicago, wherever they could find a building that looked Greco-Roman," said character actor Ken Du Main, Bradley's friend for more than 40 years. Locations included the steps of the downtown post office, and the portico of the Elks' national headquarters. The films helped open Hollywood doors for Heston and also for Bradley, who was signed up for a training program at MGM and directed "Talk About a Stranger" (1952), with George Murphy and Nancy Davis (later Nancy Reagan). "On the lot, he was whispered about as a demigod of the avant garde," Du Main said. "The idea of just going out and making your own films was new. And he was a friend of Orson Welles - that impressed them." Bradley made a few other films but fought with the studio over the re-edit of "12 to the Moon" and moved on to his real vocation, which was to hold strong opinions and express them at every opportunity. At a time when silent films were being forgotten and the studios were ignoring their archives, he began collecting prints of films. He had thousands, many the only surviving copies, and originally planned to leave them to Northwestern, but feuded with its film school. He was then teaching at UCLA and decided to leave them there, but had another feud, switched to Santa Monica City College, and willed the films to Indiana University, Du Main said. Visitors to the home he shared with Du Main in the Hollywood Hills would be treated to private screenings of rare treasures. I remember seeing the original version of Howard Hawks' "The Big Sleep" (1946) 20 years ago, at a time when Bradley had the only known copy; this version of the film, which was reshot with more scenes for Lauren Bacall, was not publicly seen until 1997. One day Bradley took me behind his house, to the concrete-block bunker that housed his archive. Row upon row of film cans and boxes towered overhead. "I brought Josef von Sternberg back here one day," Bradley recalled, "and he started clawing his way up the shelves, crying out, 'My films! My films!' "
A visit to Bradley's home was invariably an occasion for him to take center stage in his living room and lecture his guests. His lifelong passion was the Chicago Symphony. "He loved Fritz Reiner and liked Georg Solti," recalled his friend, Gregory Nava, the movie director. "But he hated Jean Martinon. He would play different versions of the same piece of music and shout out a note-by-note criticism, and then put on Reiner, and everything was glorious." He was playing a record by the despised Martinon when he kicked the footstool into the record player, prompting Du Main to caution, "Careful, David - you'll need that record for future outbursts." On New Year's Day, Bradley and Du Main would invite silent stars and directors to a party also attended by younger film folks eager to meet them. The guest lists over the years included von Sternberg, Fritz Lang, Claire Windsor, Madge Bellamy, Mae Murray, Allan Dwan, and Mary Miles Minter, whom I met there on the day she was fighting eviction from her home. "Look at this picture," she told me, holding a clipping from the Los Angeles Times of her sitting on her front steps. "How do I look?" I said I thought she looked wonderful. "What a kidder," she said. "I look like a bag lady." Well, she did, a little, and I reflected that she had once been a famous beauty whose lover, the director William Desmond Taylor, was murdered in one of Hollywood's notorious scandals. Bradley filmed every one of his New Year's Day parties, including one at which Mary Philbin, star of the 1925 "Phantom of the Opera," re-enacted the unmasking of the phantom (played by Lon Chaney in the original and by Bradley, of course, in the re-enactment). Every party's climax was the screening of a surprise treasure from Bradley's archive, starring one of his guests. The stars typically hadn't seen their films in 50 years and would be moved to tears. Bradley would kiss their feet in the closing shot of each home movie. In recent years the party faded away as the guests died. "It is so sad," Bradley told me at one of his later parties, "to look around the room and wonder who will still be here next year." "He made those people feel wonderful when the world was ignoring them," remembers writer-producer Anna Thomas, Nava's wife. "He made a fuss over them. David had a big heart. A lot of people didn't always see that because he was so cranky."